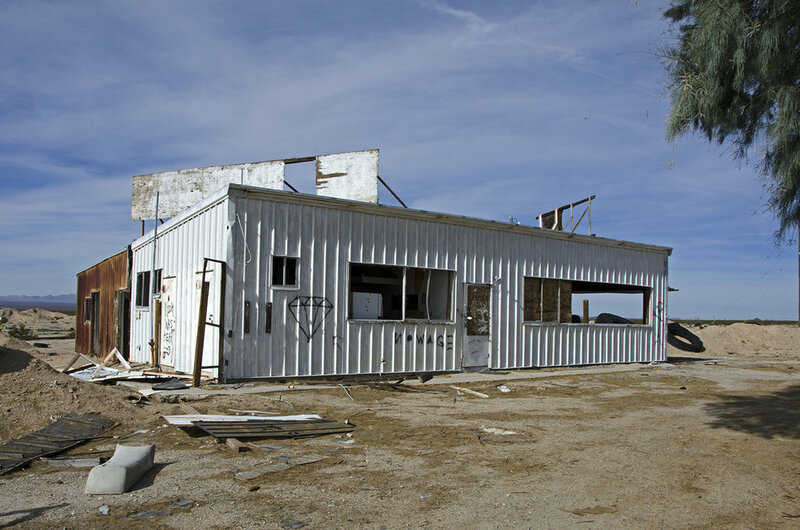 Essex dates back to 1883, like most of the almost forgotten traveler's rests and small communities that dot the Mojave desert along Route 66. Lewis Kingman, a locating engineer for the Atlantic and Pacific Railroad, named the water stops along the railroad route. He must have been a fan of alphabetical things, or maybe was directed to name the water stops in such a manner. So we have Amboy, Bristol, Cadiz, Danby, Essex, Fenner, Goffs, Homer, Ibis, Java, Khartoum and so on. During the early years of the small railroad stop, the primary purpose was to supply the steam engines with water. Essex remained a small station for many years, but with the construction of a new highway linking New York with Los Angeles that generally followed the railroad right of way, the small sidings and way stations along the route began to prosper and grow. Such was the case with Essex. When Route 66 was created, it incorporated much of the old highway and improved it from a sandy, unpaved road prone to washouts from even small storms, into a wider, paved highway. Route 66 underwent many transformations and realignments over the years, and luckily for Essex, the road went right through the small settlement. A couple interesting notes about Essex. Due to its remote location, television didn't come to town until 1977. And to commemorate the event, the story goes that the entire population of the town attended a taping of The Tonight Show with Johnny Carson. At least, that's the story. Essex was also famous for providing free water to travelers. Most of the traveler's stops out in the Mojave would charge for water, but the Automobile Club of Southern California had a well dug and a drinking fountain placed near the old cafe, and the water was free. Many of the homes and businesses that once flourished here have completely gone or are in a sad state of decay. But there are still a few interesting things for visitors to see, if you're interested in old ruins and photo opportunities. The remains of the Cafe and general store. The small building to the right of the cafe once held restrooms. A more straight-on view of the cafe. I believe the rock portion on the left may have held a general store. The gas pumps are long gone. Air conditioning and good food, probably a good draw for travelers driving by. This old stone building stands just to the east of the Cafe, it once held the post office and still appears to serve the community with mail delivery. I'm not sure if the well built by the auto club is still in existence, I didn't know to look for it until after I returned home and did a little research. It was/is somewhere near the old market. Maybe someone reading this can let me know and I'll get a photo next time I'm in Essex. This large, dilapidated home stands across the street from the Cafe. With a garage or workshop out back. A couple miles east of town are the remains of what appears to be a service station. And a lot of refuse. And that's what I saw on this trip in Essex. I'm sure I'll be back at some point in the future to see what else I can find. Here are a couple old postcards showing what the Wayside Camp, Cafe and Store once looked like. There were apparently small cabins to rent for road weary travelers to spend the night. The photo on the left was taken in 1932, I'm not sure of the year for the picture on the right.